"Thanks to the breaks the Internal Revenue Service gives you and the infinite possibilities for creative financing teaches you, there is no limit to the fortune you can build in this way!!" "Al, your course has had a long and lasting impact upon my life. More than just making me rich, your program gave me my freedom! Thank you!" "For years Lowry has been showing investors how to keep the down payment low and then finance the rest as painlessly as possible." "There's probably no better investment than land and buildings. Albert Lowry, who wrote How You Can Become Financially Independent by Investing in Real Estate, worked as a butcher and steel mill laborer until he began studying real estate in his spare time. Within 7 years, he became financially independent." "(Dr. Lowry's) seminars insruct sellout audiences across the country how to buy a first house and also how to make money by investing in real estate"
"If anybody knows how to make money in any type of real estate market, Albert Lowry does." "Not all of us have the confidence to wheel and deal extensively, but that's what Lowry's books and classes are aimed at helping us do! He, unlike some other investment advisers, learned the subject by doing and went to school to learn the theories later. Lowry has made millions doing it and believes we can too, if we follow his advice." "Albert Lowry shows it's possible to buy a house with little or no down paymentif you know where to look and how to do it. Then you can sell the same property at a profit if you're willing to take simple steps..."
"The fastest way to make a million? Learning to win at the real estate game. Albert Lowry, the premier real estate guru, has shared his methods and helped create many brand-new millionaires from former regular working people." Financial independence is within your grasp. Get started today! Can this be true? The fact is, over time, real estate investment returns outpace stocks, bonds, mutual funds, or any savings accounts. In America alone, 85% of wealthy Americans built their fortunes through real estate, many starting out with just some basic principles, determination, and a mindset for success. What does this mean for you? If you're determined that you want to be successful, then I can help you learn my simple formula that is the key to your wealth building. I promise you, if you are serious about succeeding and can follow some basic guidelines, then you are already well underway to joining those who are enjoying financial independence. Let me explain. If you're already a real estate investor, you've seen the possibilities. Now, I'll show you how to really get into the game and find out where the real money is. You'll find funding for down payments on houses and multi-family buildings, for closing costs, to renovate and upgrade your existing properties, to help your tenants pay you, to pay your mortgages, plus many more cash resources you can tap into. You can be confident that this is a sound investment because I have helped thousands of people just like you. I've been recognized as the man who engineered the technique that the other real estate gurus have modeled to build large real estate empires, make millions, and also teach others, all using the methods they learned from me. I became known as the "experts' expert" because a number of famous experts started out as my students, such as Robert Kiyosaki, Russ Whitney, Robert Shemin, Robert Allen, Carlton Sheets, Ron LeGrand, well, you get the idea. When you buy and resell a qualifying foreclosure property within 180 days of your course purchase, you not only get back the money you paid for my course, you also get to keep the course for your unlimited use and profitable future deals. 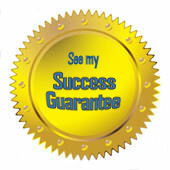 You can be my very next real estate success story if you take the first step right now.